Protecting children from child labor is a complex issue, and it starts by addressing the economic pressure on the family, which can often be the reason for sending a child to work. Child labor is a growing issue, as refugee and displaced families in Lebanon and Syria increasingly struggle to meet their basic needs and work is hard to find; 76% of Syrian refugees in Lebanon live below the poverty line. In Lebanon’s Bekaa Valley there is high demand for cheap labor in agricultural work, and amongst our partners working in this area, it is common to hear stories from families who feel they have no option but to send some of their children to work. My 6-year-old daughter sells roses on the streets. Her father used to take her but he is very sick now, so she goes alone. I’m afraid for her but we have no choice. It all starts with basic needs assistance! MERATH’s local partners recognise the seriousness of this issue, and are seeking to respond. 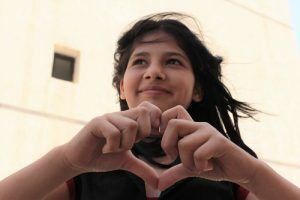 A core component of MERATH’s work has always been basic needs assistance, partnering with local churches in the Arab world to provide vulnerable Syrian families with food, winter items, fuel and other necessities. Because child labor is often a coping strategy a family turns to when they have no other option, such assistance can make the difference between a child having to work or having the opportunity of education. At 11 years old, Fayçal’s home in Syria was destroyed, and he and his family were forced to flee to another part of Syria. When his father was injured and became paralyzed, Fayçal felt that he had no choice but to drop out of school to find work at a car wash to provide for the basic needs of his parents and younger sister. A local church leader, one of MERATH’s partners, found Fayçal and his family and got to know them and their situation. The church added Fayçal’s family to the monthly food assistance project, as well as providing them with blankets and warm clothes. Because of this additional support, Fayçal was able to go back to school and continue his education. Lack of access to education is a key factor in enabling child labor, and at least 41% of children age 6-14 in Lebanon’s Bekaa Valley are still out of school. 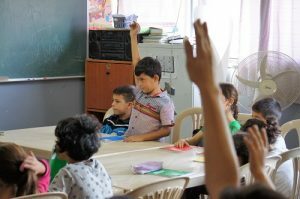 MERATH partners with 9 non-formal education projects for out-of-school children in Lebanon, reaching 1,500 children with basic education and psychosocial support, in areas where Syrian children are unable to access education in public schools, or need additional help. Several projects provide extra after-school educational support to Syrian children enrolled in public schools, to enable them to cope with the Lebanese curriculum, catch up missed years of learning, and give them the confidence and skills they need to remain in school. In one centre it was encouraging recently to hear stories of how two older boys had been taken out of school in order to work, but when the staff at the education centre talked with the parents, they were able to convince them of the importance of education and the children are now back in school. 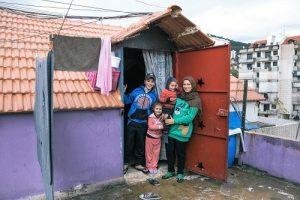 MERATH is also looking to find new ways to support families to meet their own needs, both in Syria, as communities seek to rebuild, and in Lebanon. One partner is including vocational training and career orientation in their education programme, and several others are starting livelihoods projects to support people to learn and use skills to generate income, including sewing projects, hairdressing, mobile phone repairs and agriculture. MERATH is developing a new livelihoods project that will directly target youth.